“Man’s suicide thwarted on Christmas Eve” sounds like a newspaper headline, not the premise of a holiday tradition. In American Theatre’s 8th-annual production, Frank Capra’s 1946 film, It’s a Wonderful Life, based on the book The Greatest Gift, is re-imagined on stage as a radio play. Though most have seen the movie, the story deals with a distraught businessman George Bailey who eventually considers killing himself so his family may benefit from a life insurance policy. Clarence, angel second class, tries to earn his wings by helping George understand significance of his life. Performed in 80 minutes without an intermission, American Theatre Company’s It’s a Wonderful Life: The Radio Play is a nicely wrapped holiday gift. It could possibly be said that Wonderful Life is the original dramedy. The plot is Hollywood’s schmaltzy tragedy with a “feel good” happy ending. Within the story of a suicide attempt, the Capra team has created strong characters delivering memorable lines. “Why don’t you kiss her instead of talking her to death?”, “Youth is wasted on the wrong people.”, “No gin tonight, son!”, “Get me…I’m giving out wings.”, “Excuse me! Excuse me! I burped!”, “Every time a bell rings, an angel gets his wings,” and the ever powerful, “Strange, isn’t it? Each man’s life touches so many other lives. When he isn’t around he leaves an awful hole, doesn’t he?” The timeless lines invoke the familiar swirl of sentimental tears and chuckles. Another player that provides dead-on imitations of multiple characters is Jessie Fisher. As man-eater Violet, Fisher seductively says, “What? This old thing? Why I only wear it when I don’t care how I look.” Then Fisher becomes 8 year old Zu-Zu with, “Not a smidge of temperature.” Although Kareem Bandealy is no Jimmy Stewart, his George Bailey gives a complex range of emotions of a dream seeker -small town hero- suicidal- “richest man in Bedford Falls.” Under the well-paced direction of Gerace, the multi-talented cast energetically lassoes the moon. For a radio play performed as a stage play, the foley artist (the person who creates many of the natural, everyday sound effects for a live radio show) always adds an interesting element of sound production. With this show, this doesn’t seem to be occur. The foley artist (Rick Kubes) is set up on the side of the stage with various tools and techniques to add the sounds to the radio broadcast. Plunging in the river, clattering dishes, blizzard winds – these radio elements are not completely audibly realized. Kubes needs to crank up the volume! And speaking of audio, preshow, the audience is given an opportunity to write audiograms. During radio commercial breaks, the audiograms are delivered by the cast. Holiday greetings are mixed with requests for parking money as the messages are broadcasted to and from audience members. It’s a nice personal holiday touch and cheaper than buying cards. Enjoy complimentary pizza in the famous Chopin Theatre lobby before the performance, then stick around for the world premiere production written by rock journalist Mark Guarino and based on and featuring the music and artwork of Bloodshot Records recording artist Jon Langford (Mekons, Waco Brothers). This phantasmic journey into the mind of a fictional country music legend is what an episode of Howdy Doody might look like if it were directed by David Lynch. Sadly reflective and yet hilariously surreal, House Theatre’s All the Fame of Lofty Deeds mixes rock biography, live music and stunning visual effects to tell a tripped out tale of the demise of America’s last living cowboy. 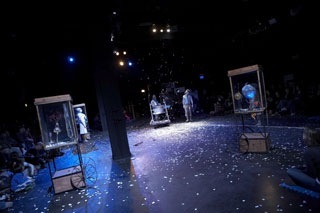 Stick around after the performance for a talk back with the some of the show’s cast and creative team. For reservations call 773.251.2195 and mention "Theater Thursdays." “Everybody’s Got the Right” from Stephen Sondheim’s 1991 musical Assassins. This Youtube video includes Neil Patrick Harris, Dennis O’Hare, Michael Cerveris (with hair! 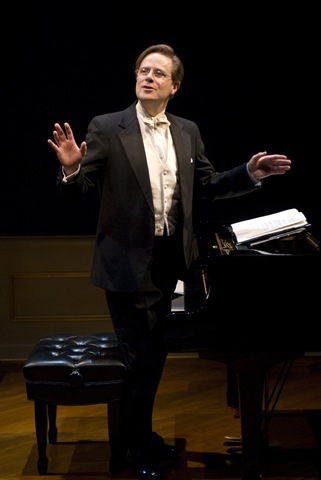 ), James Barbour, Alexander Gemignani, and Mario Cantone. I have to admit to a bit of “Scrooge-ism” when it comes to the holiday season in America. The commercials, the billboards, the store windows dressed in fiberglass snow and plaid carolers when I am still finishing Halloween candy stuffed in the bottom desk drawer- you get the idea. I managed to get into the spirit in spite of myself. I got a visit from a little angel in the form of my niece Alexandria. She is a very precocious seven years old who likes spiders. 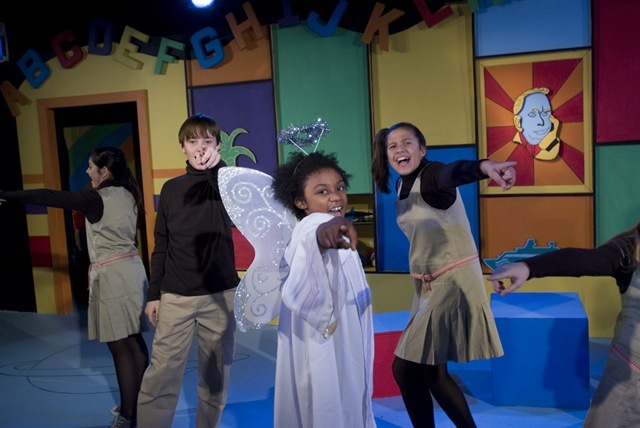 Porchlight Theatre’s publicity for Miracle on 34th Street stated that this was the perfect first theater experience for children and would become a holiday tradition. I am happy to say that the publicity was right. 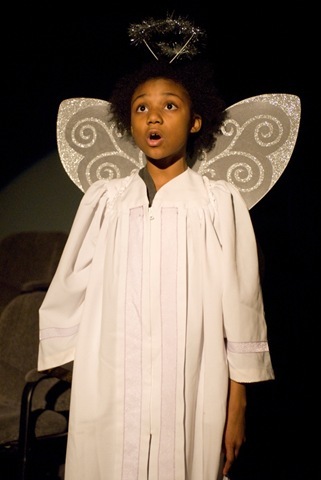 This production of Miracle on 34th Street is from the Porchlight Music Theatre Company. They are known for classic productions as well as new interpretations of musicals. This is already a classic film and now it has been excellently translated to the stage. The moment that Kris Kringle’s sleigh appears on the stage is when the magic begins. 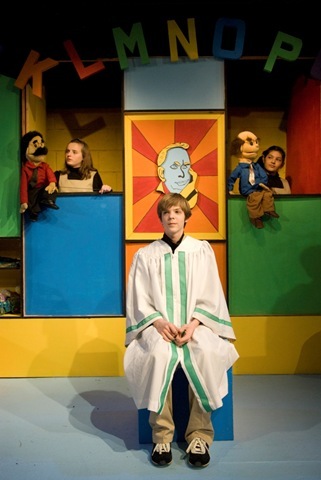 A veritable toyland pops out of Santa’s big red sack and performs to start the play. We are then told that this Santa is a lucky replacement for the other guy who showed up drunk. The twist is that this Santa believes that he is the real thing. It is a tale that we all know from afternoons around the television or at the repertory movie house. Christa Buck plays the cynical 1940’s career woman Doris Walker. She is all business and doesn’t have time for the fantasy that is Christmas. She also has little patience for the complications of romance that shows up in the form of Fred Gailey played by Karl Hamilton. They both seem to have stepped out of a Technicolor production. The entire cast is a step back in time and that is perfect for this production. The cynicism of Doris Walker and her daughter Susan is born out of divorce and abandonment issues. That is my modern interpretation but the portrayals are embodied with the post-war innocence of the 1940’s. Somehow everything works out in America if you only believe. It’s a beautiful idea whose time is coming around again. The part of Susan Walker is played by Laney Kraus-Taddeo. 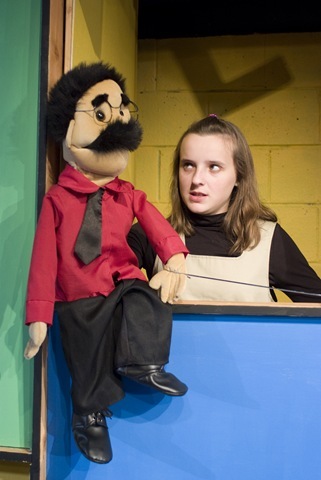 She is another talented product of the Piven Theatre Workshop in Evanston. 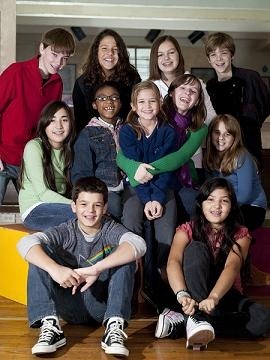 Ms. Kraus-Taddeo doesn’t hit any false notes or project any of the treacle that is the risk of any child actors. 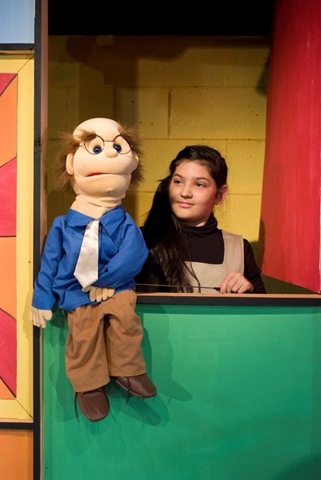 All of the children in this production are a delight to watch. 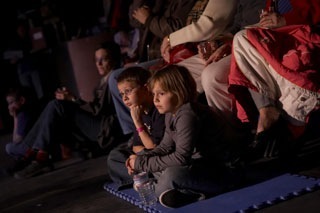 The play makes room for a child in the audience to talk to Santa on stage. It was a funny moment with an untrained participant who asked for Christmas lipstick. Your guess is as good as mine as to what that is but Jim Sherman as Kris Kringle played right along with jolly humor. I have to say that it was the performance of Jim Sherman that really put me in the Christmas spirit. He has the sparkle and the charm that – for me – embody Santa Claus. He wears a suit that is more in the tradition of Father Christmas or Sinter Klass from the Netherlands. Even when he was clad in layperson’s attire he looked like Santa. I also enjoyed the character of Mr. Macy played by Chuck Sisson. I’m a girl who grew up on Mr. Drysdale, Mr. Mooney, and Thurston Howell III. There is a certain carriage and technique to carrying off the bluster of such a character in my opinion and Mr. Sisson has it much to my enjoyment. The entire cast is a joy to watch in Miracle on 34th Street. The supporting villain character of Mr. Sawyer is played with relish by Rus Rainear. Like the movie, Mr. Sawyer is a ferret-like guy who almost kills Christmas while in cahoots with the ambitious District Attorney played by Steve Tomlitz. You have to bring your own camera and resist the urge to want to sit on Jim Sherman’s lap yourself. I’m telling you, the guy took me back to 1965 when I really believed. Fresh from its triumphant Halloween performance at the White House, Redmoon Theater stages its nearly annual, alternative take on a family holiday show, Winter Pageant. The theme of these shows over their 15-year history is always the same: Each unique pageant showcases the progression of the seasons and celebrates the return of spring — in always charming and often magical ways. The production avoids religion, hackneyed classics and Christmas commercialism and, as Artistic Director Frank Maugeri puts it, engineers "a journey that explores nature, humanity, ritual, storytelling…." This year, perhaps because the production reprises performance elements from the troupe’s White House spectacle, much of the storytelling seems to have been lost. Instead, we have a disjointed, hour-long series of vignettes and technical wizardry. Plots have never been the strong point of these pageants, I grant you, yet usually there’s been a tale of sorts to carry the audience along. Not only did I miss that, it became clear from the restlessness of the young audience that the kids did, too. Not that there aren’t plenty of wondrous sights for children. 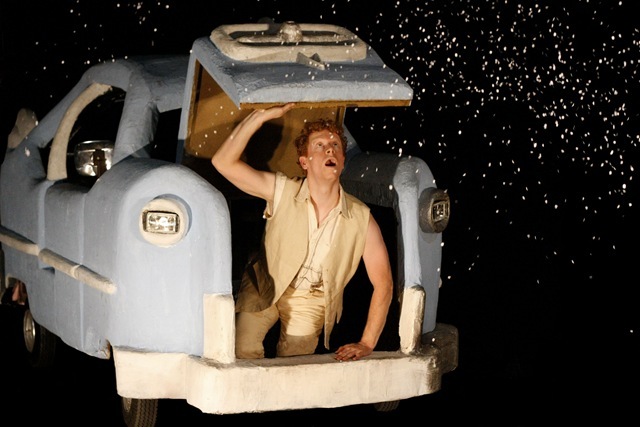 As the show opened and a young woman played with a toy car, I saw a father struggling to restrain his squirming 2-year-old, who wanted mightily to get in on the action. The toy morphs into a marvelous full-sized car full of characters and cakes and a monstrous, goodie-stealing baby. Then we have a mechanical surrey with a flower garden and a bug-eating gardener on top — evidently representing summer. Judging by the colors and timing, next come autumnal rains and a marvelous underwater sequence that had the kids charging out of their seats. We also get some absurd pirates and wonderful illuminated hat puppets representing migrating swans. A bountiful banquet becomes a food fight. Winter, a dark and chilly sequence of crooked doll houses and shadow puppetry, follows. Spring explodes in drumming and tulips, but nevertheless seems anticlimactic. 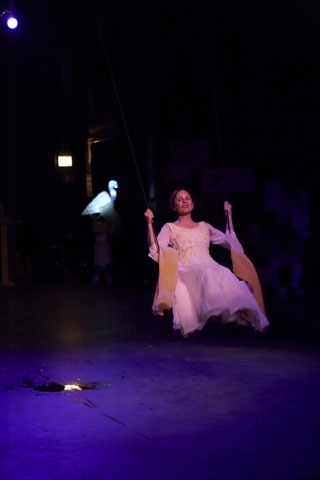 Redmoon’s artistry is wonderful throughout, but this year’s pageant is perhaps best seen as a showcase of performance art, a series of artful spectacles, rather than a winter’s tale. Note: Free parking at the theater and in a lot across the street. 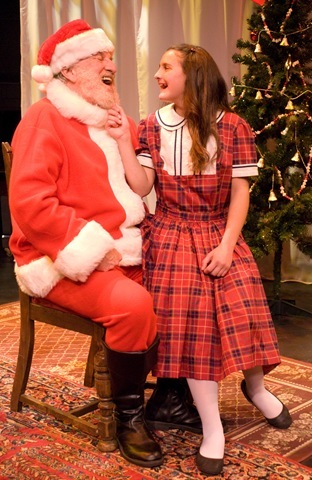 It’s only November, but if you are already tired of virgin births, wise men led by stars, angels singing to shepherds or animals talking in mangers, then A Red Orchid Theatre’s remount of A Very Merry Children’s Scientology Pageant just might be the cure for what ails you. Based upon the self-promoted achievements of L. Ron Hubbard, the pageant explores one man’s search for the answers to life’s most important questions and his creation of the religion Scientology. That children enact this story is the stroke of genius that A Red Orchid Theatre can pat itself on the back over for years to come. The pageant has quickly morphed into Chicago’s brand new holiday favorite–what with Next Theatre opening its production in two weeks. Will Chicago survive dueling Scientology pageants? Will these theaters survive an onslaught from Scientology’s lawyers? Is this a sign of the Apocalypse? I hardly know which is scarier–Scientology, the story of the creation of Scientology, or the amount of talent these kids possess. Director Steve Wilson has one tight group of young actors at his disposal. They rock the house with angelic paeans to L. Ron Hubbard, slow-motion battle scenes, hilarious E-meter demonstrations, and fabulous portrayal of the sinister galactic overlord, Xenu. One actor even looks like a pre-teen Tom Cruise—now that’s scary. In a classic moment of paranoia, I considered whether this satire could actually be a vehicle promoting Scientology. For L. Ron, all paths for spiritual growth sooner or later lead to Hawaii. And why not? All the same, other than blasting away your engrams or your Thetans, Scientology still doesn’t have answers for who we are or what life’s purpose is all about. But in the midst of the joy of the Scientology pageant, we really don’t care. A Very Merry Unauthorized Children’s Scientology Pageant features A Red Orchid Theatre Youth Ensemble members Chaz Allen, Najwa Brown, Jaiden Fallo, Paola Lehman, Adam Rebora, Kara Ryan, Elenna Sindler and Aria Szalai-Raymond; as well as newcomers Elita Ernsteen, Katherine Jordan, and Alex Turner. 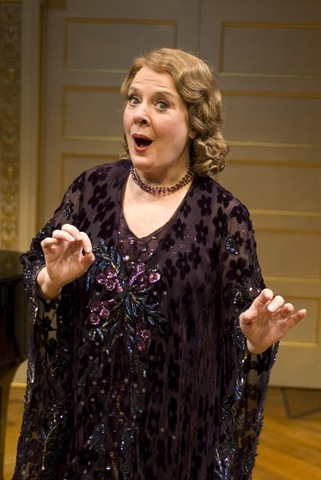 Thanksgiving Day 2009 marks the 65th anniversary of the death of the legendary Florence Foster Jenkins, a New York society phenomenon of the 1930s and ’40s. A vocalist as passionate as she was talentless, Jenkins, then nearly 60, launched a singing career that brought her a hugely enthusiastic following and propelled her to the heights of a Carnegie Hall recital at the age of 76 — despite having no more ability than when she began. This well-crafted historical fiction concentrates as much — if not more — on McMoon as on Jenkins. 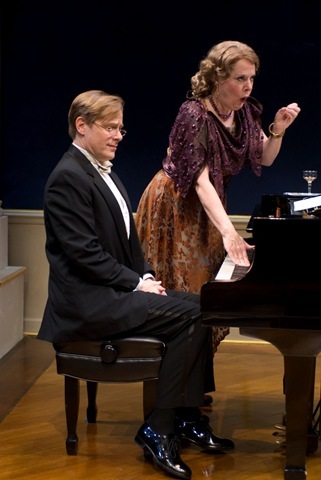 The play begins some 20 years after the singer’s death, as the failed composer and pianist, reduced to playing at a piano bar, reminisces in deft monologues punctuated by period songs and flashbacks. Anders’ deadpan delivery and dead-on timing form the hinge pin of the production’s sparkling comedy, ornamented by Powers’ trilling volubility and mercifully brief but uproarious recreations of Jenkins’ performance style. 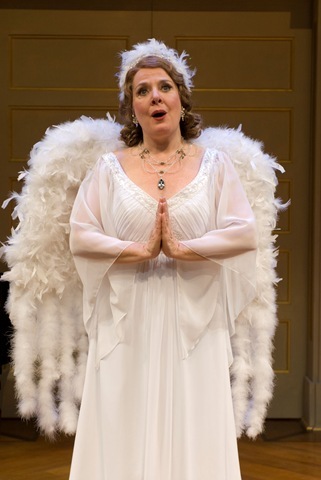 Imagine Julia Child, crossed with Edith Bunker, singing an aria by Mozart — or “Mr. Mozart,” as Jenkins refers to him. We’re not talking about the deliberately terrible music of comic artists like “Jonathan and Darlene Edwards” (Paul Weston and Jo Stafford), who recorded such subtly awful hits as “Paris in the Spring” in the 1950s, or Leona Anderson, who released the aptly titled “Music to Suffer By” in 1957. 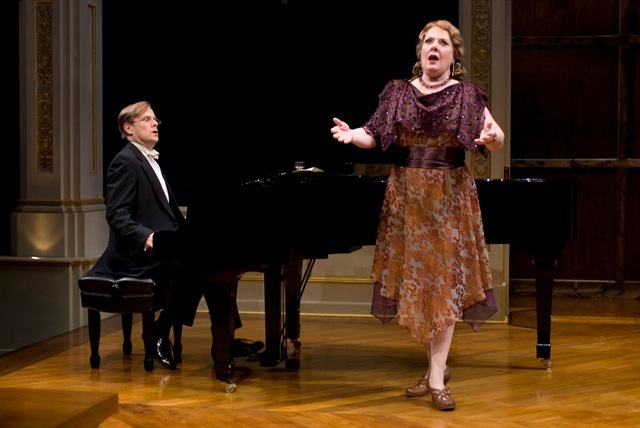 Jenkins truly thought herself a great singer, a coloratura with perfect pitch. McMoon, originally horrified — Anders’ thunderstruck expression when he first hears her is priceless — rather reluctantly takes on the job of accompanist because he needs the money, but gradually becomes charmed by and protective of his elderly patron. The counterpoint between the two characters is delicious. McMoon struggles earnestly to remain diplomatic and keep Jenkins’ illusions alive, despite her own best efforts to expose her flawed warbling to an unkind world … in ever more elaborate costumes. (Costume Designer Theresa Ham does her proud, in both period street wear and the glittering outfits Powers dons for Jenkins’ recitals, especially the reenactment of her ultimate 1944 concert, which just might be worth the ticket price by itself. The script sticks entirely to Jenkins’ musical career, not touching on her failed marriage or her unconventional love life. We learn a bit more of McMoon, enough to understand his motivations and catch a dark edge that sharpens the play’s sophisticated humor. This is definitely one of those shows that leaves the audience wanting to know more about its characters. Souvenir is heartwarming, inspiring and very, very funny. Don’t miss it.